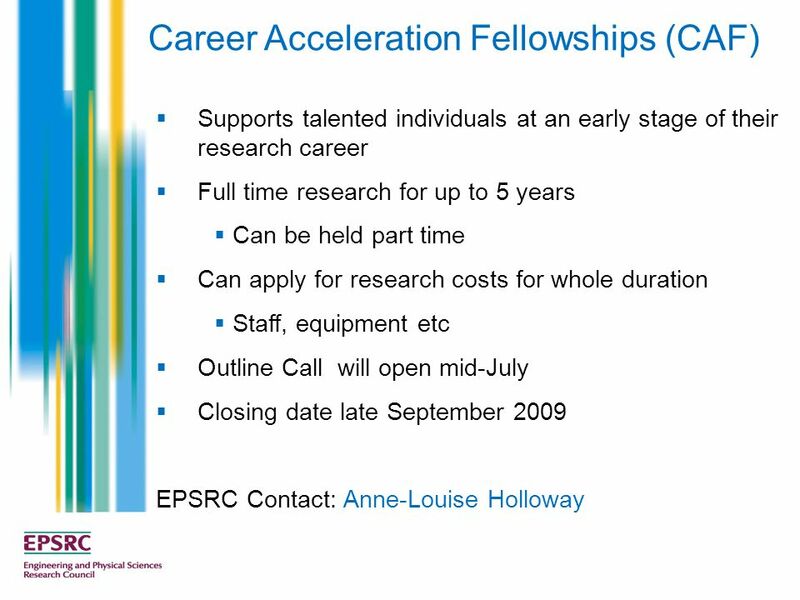 EPSRC Fellowships Dr. Anne-Louise Holloway Research Capability Imperial College London, 19 th June 2009. 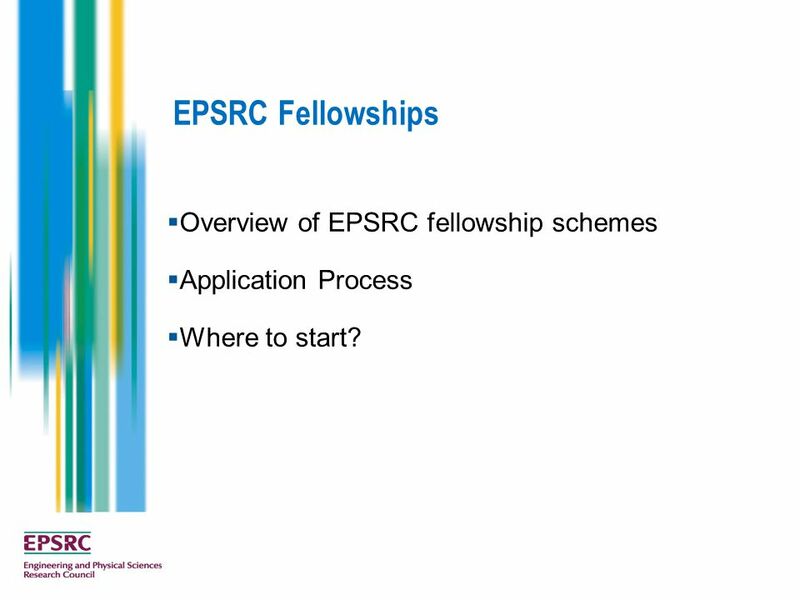 2 EPSRC Fellowships  Overview of EPSRC fellowship schemes  Application Process  Where to start? 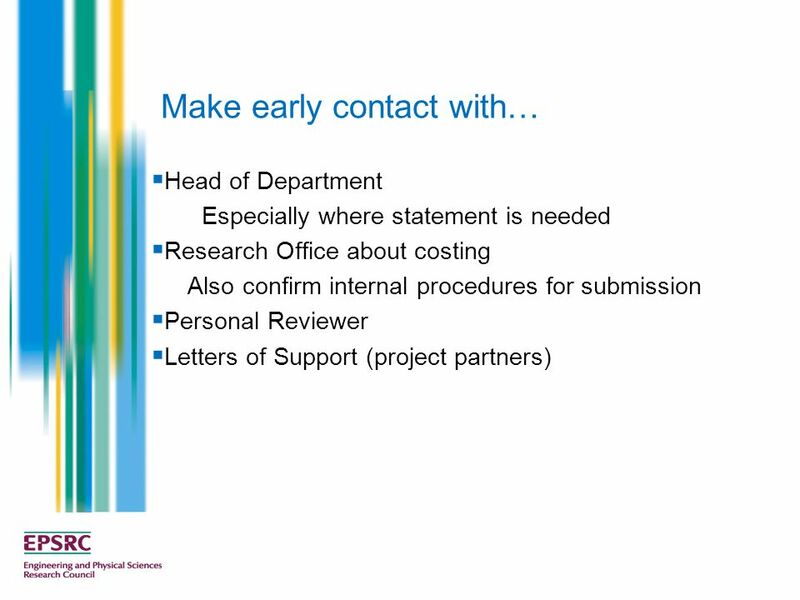 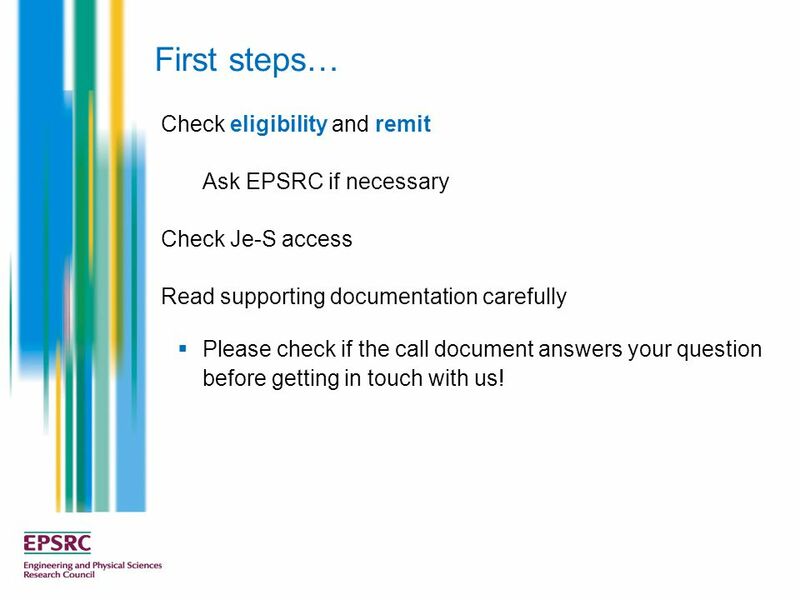 20 First steps… Check eligibility and remit Ask EPSRC if necessary Check Je-S access Read supporting documentation carefully  Please check if the call document answers your question before getting in touch with us! 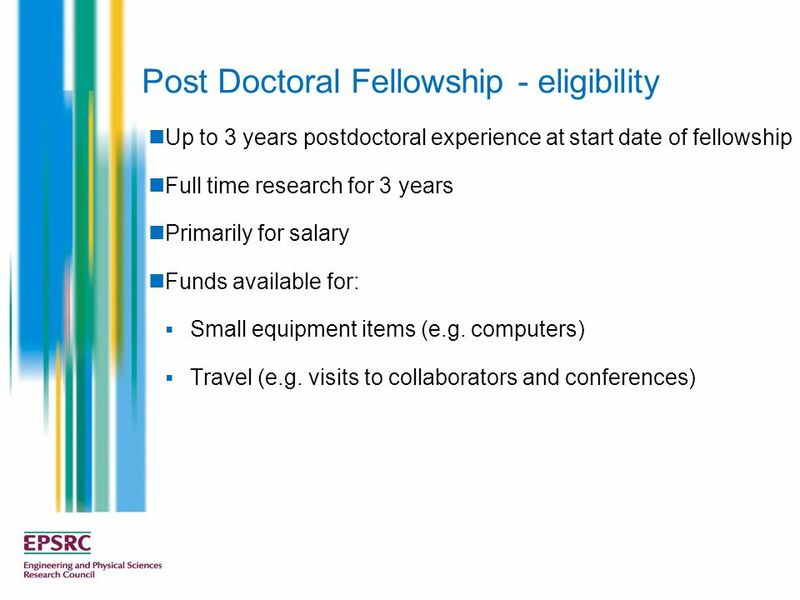 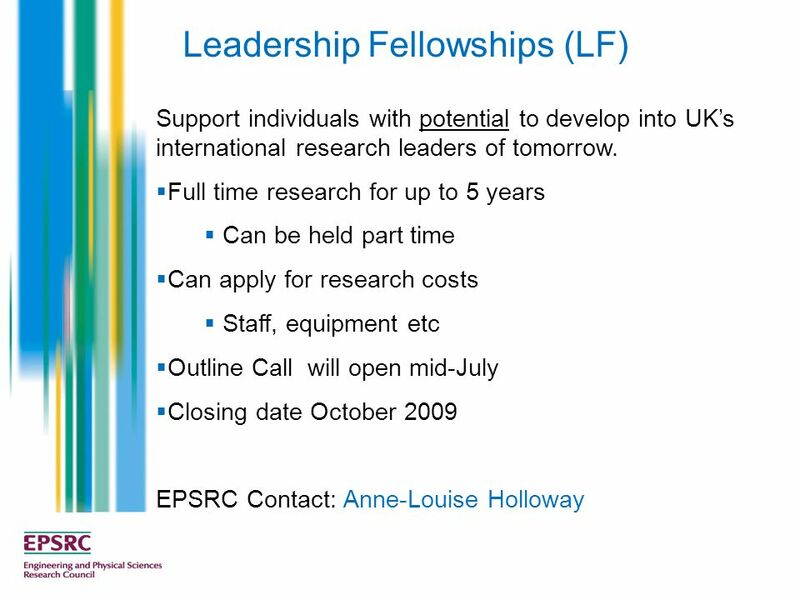 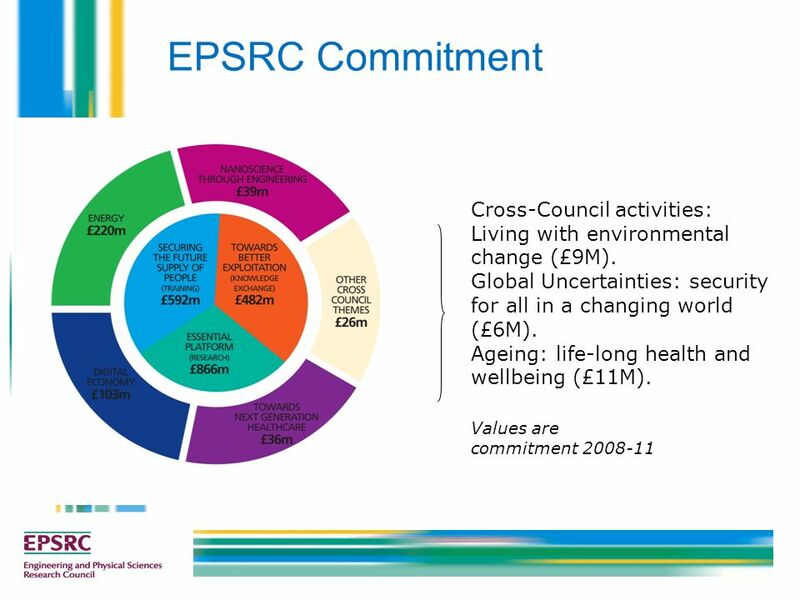 Download ppt "EPSRC Fellowships Dr. Anne-Louise Holloway Research Capability Imperial College London, 19 th June 2009." 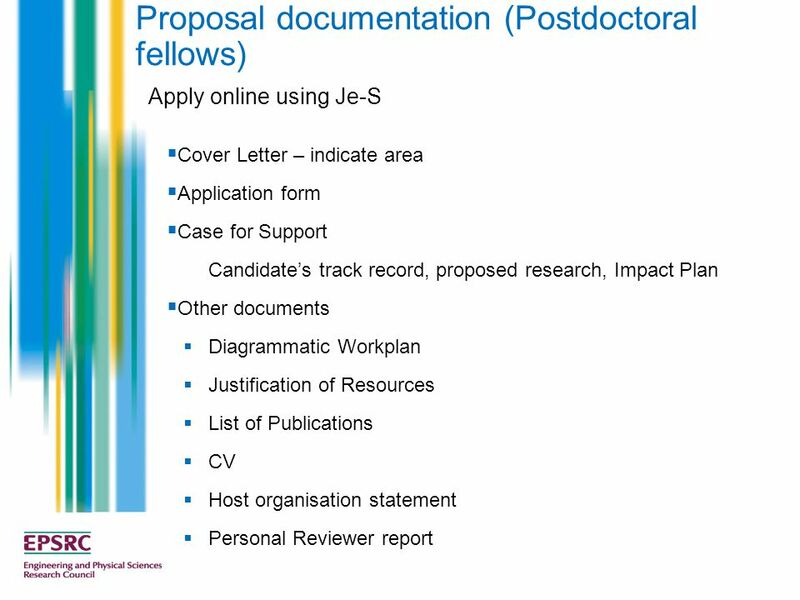 Developing Successful Fellowship Applications Dr Jane Wellens Steven Hardy. 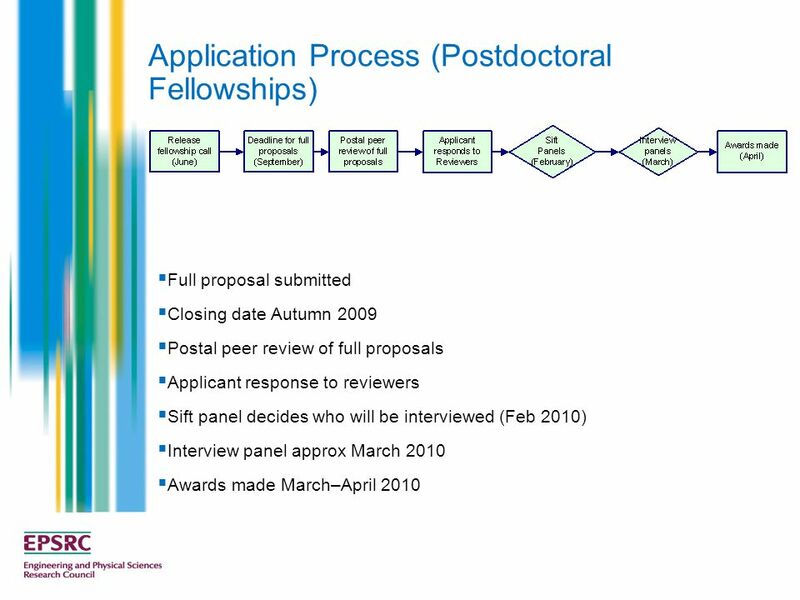 Friday, April 04, Applying for a Fellowship Research Staff Conference 2012 Rebecca Stokes Research Policy Officer Research and Graduate Services. 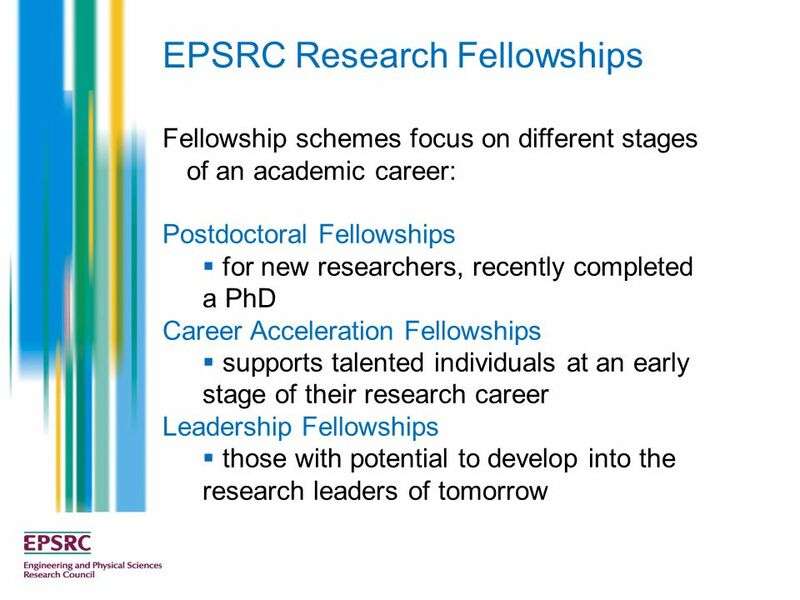 ESRC meets PhD students Professor Chris Phillipson ESRC Training and Development Board. 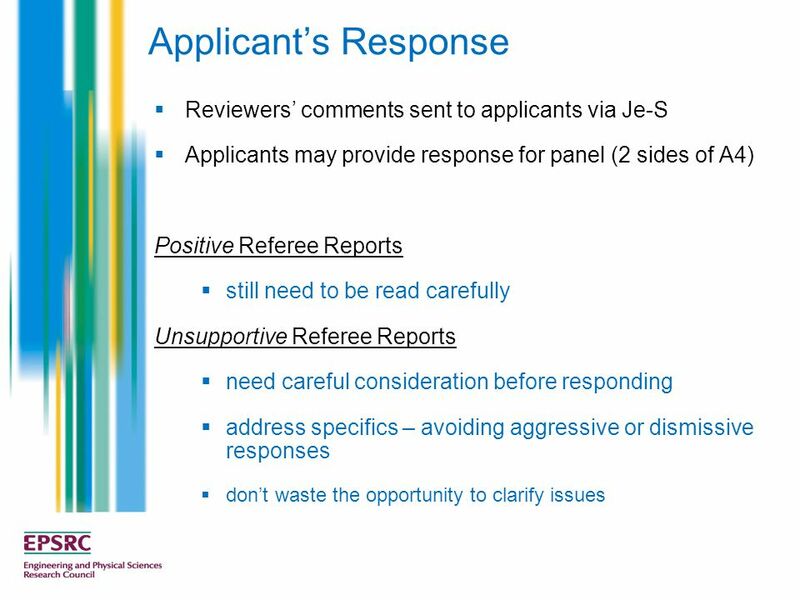 The Peer Review College and the application process Arts and Humanities Research Council. 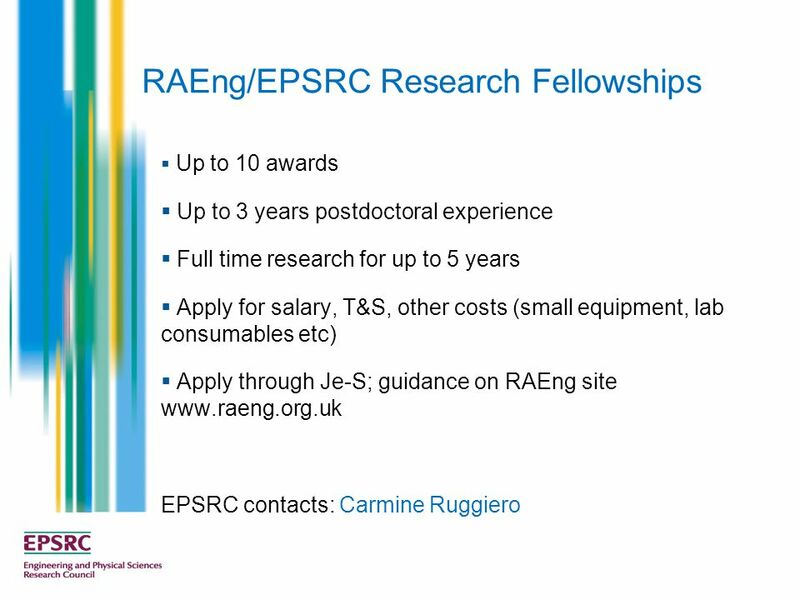 Funding Opportunities ENGINEERING AND PHYSICAL SCIENCES RESEARCH COUNCIL Caterina Mora and Vivienne Blackstone, Mathematical Sciences Women in Mathematics. 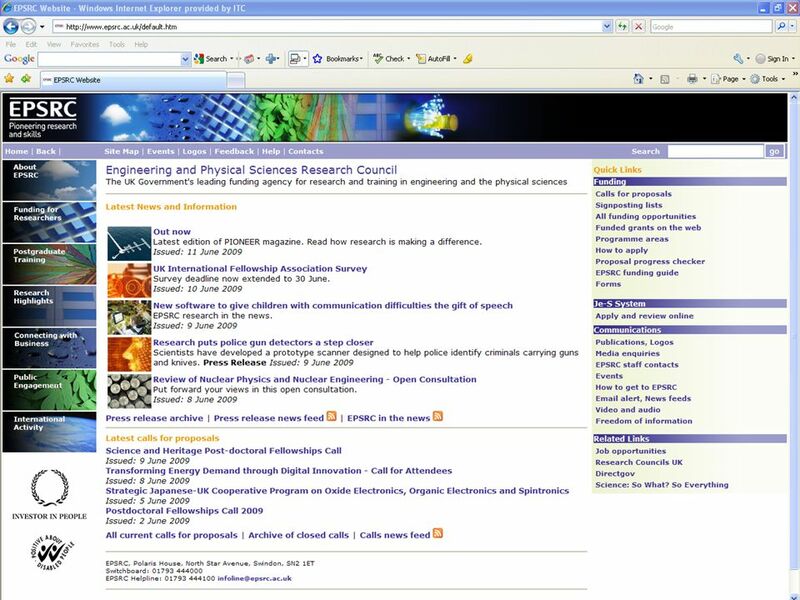 Imperial College London July 2010 The Wellcome Trust. 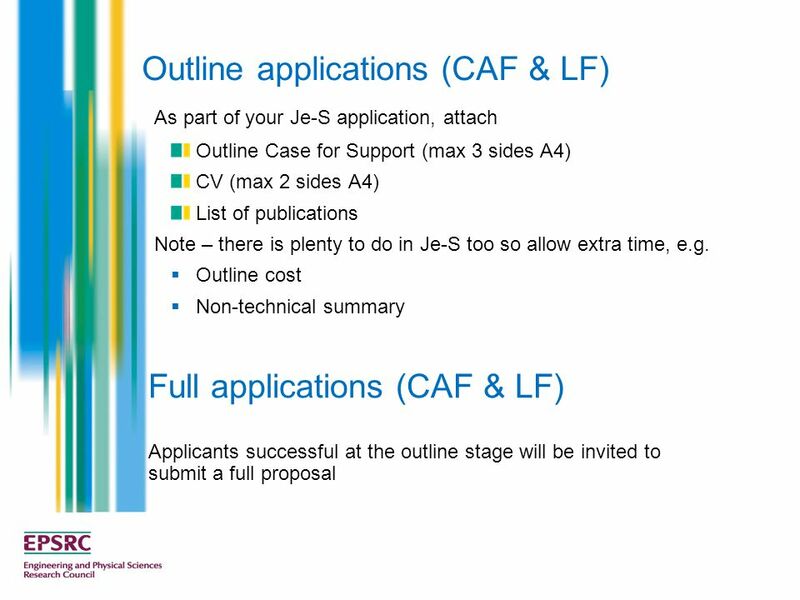 Je-S training. 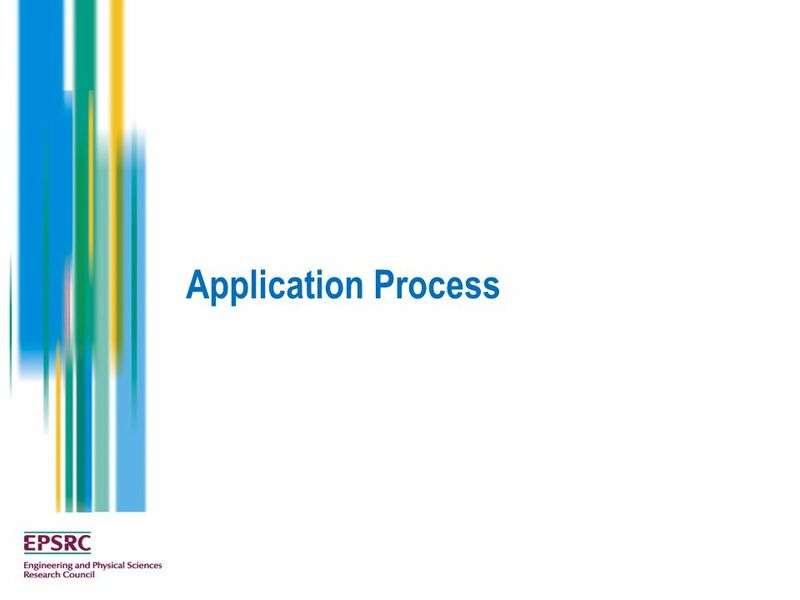 What is Je-S Where to start Getting started How to create an account Creating an application Getting help Attachments Tips and advice. 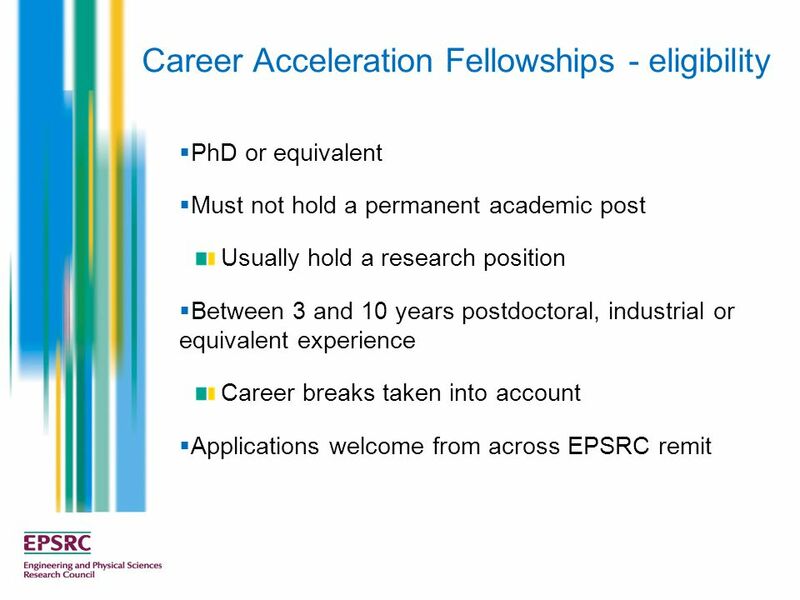 Slide detailsEngineering and Physical Sciences Research Council EPSRC Fellowships: a new fellowship framework ENGINEERING AND PHYSICAL SCIENCES RESEARCH. 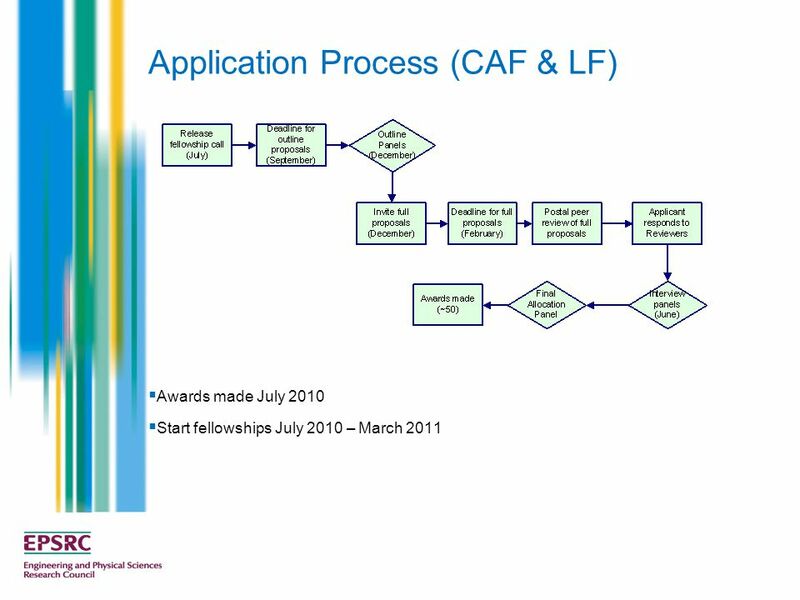 Specialist leaders of education Briefing session for potential applicants - Cohort 4 SLEs Application Window 2 – 23 October 2013. 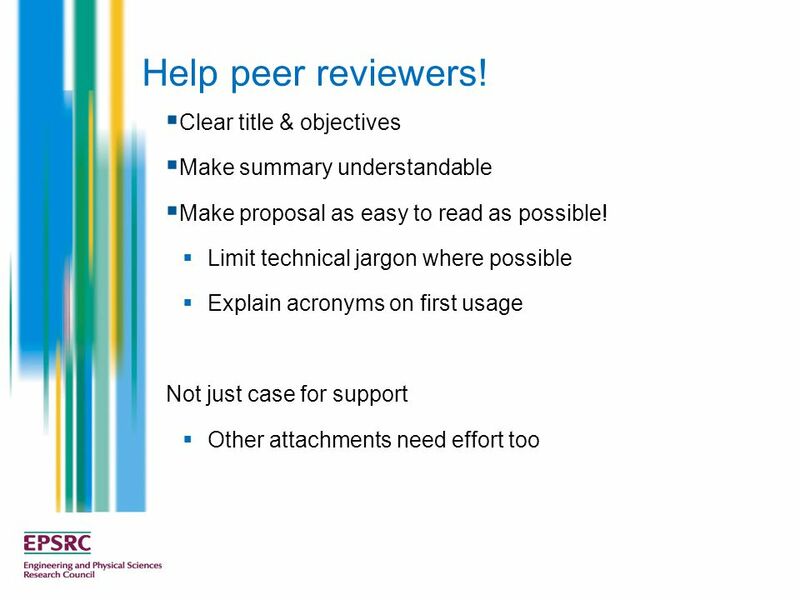 How to write successful fellowship applications Dr Liz Elvidge, Head, Postdoc Development Centre. 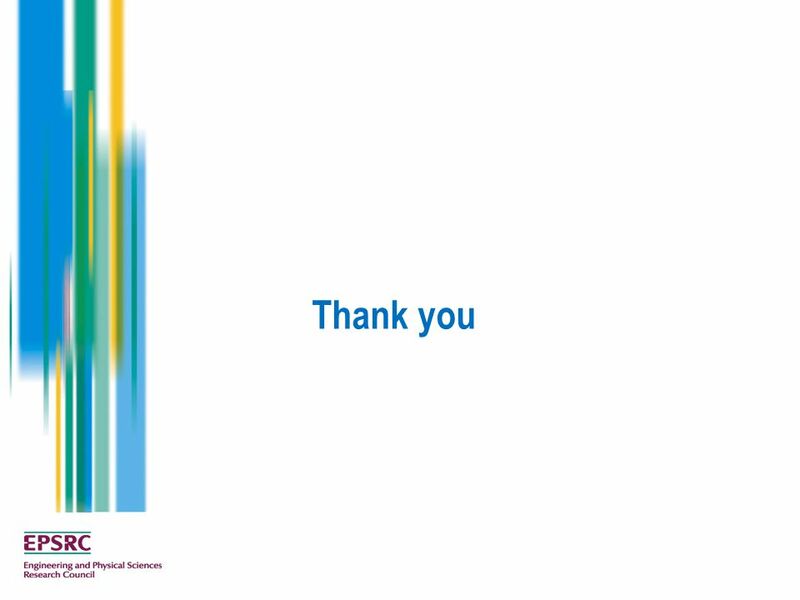 BIRAX Regenerative Medicine Initiative Created by the British Embassy, Israel and the British Council with the aim of strengthening academic. 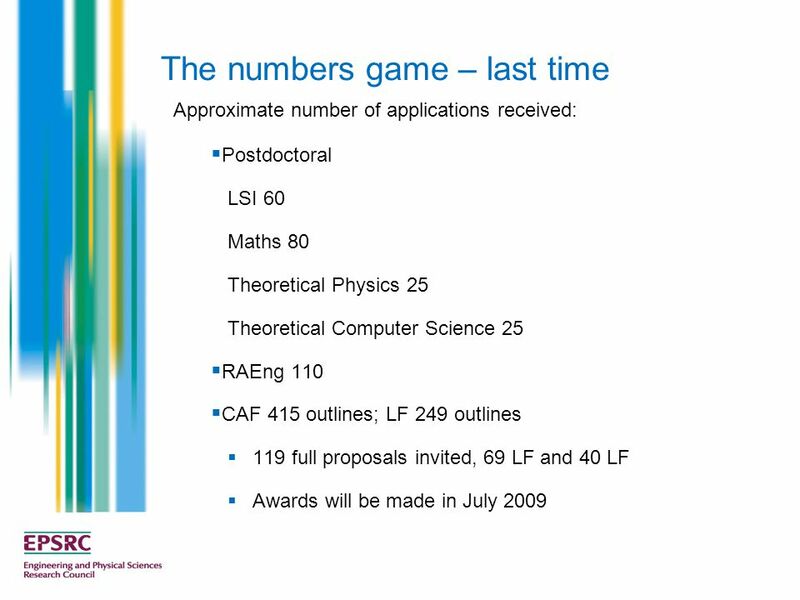 Overview of Upcoming SFI Grant Schemes Professor Brian Fitzgerald Vice-President Research University of Limerick. 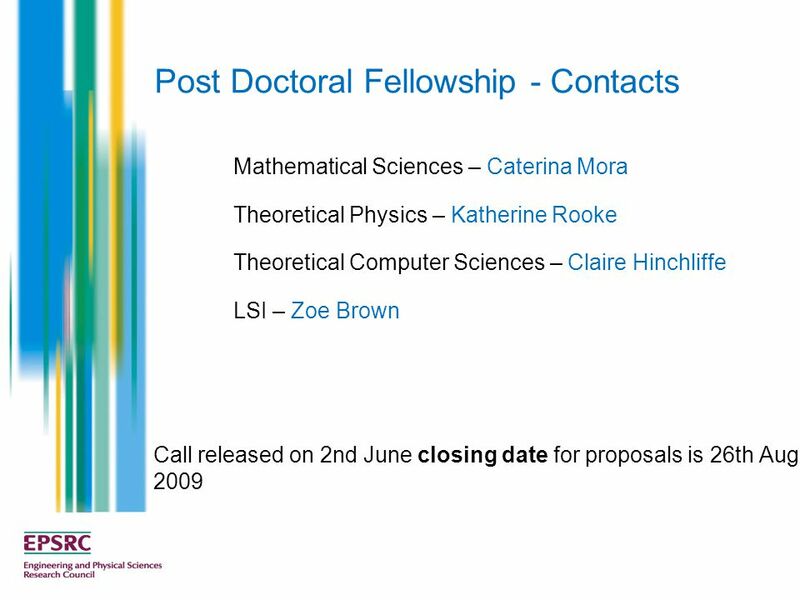 Postdoctoral Research Funding Vicky Garnett Embark Initiative 14 th Dec 2006. 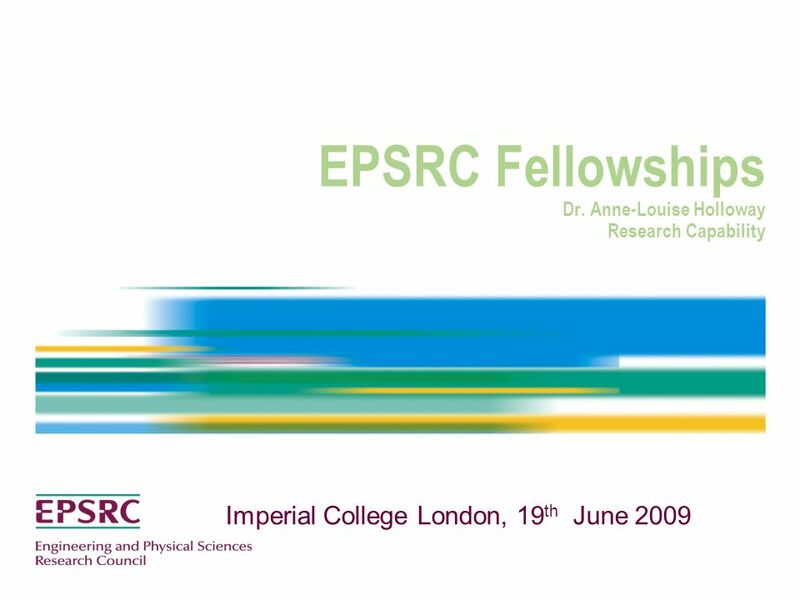 © Imperial College LondonPage 1 Applying for Fellowships Physics RAs June 2009. 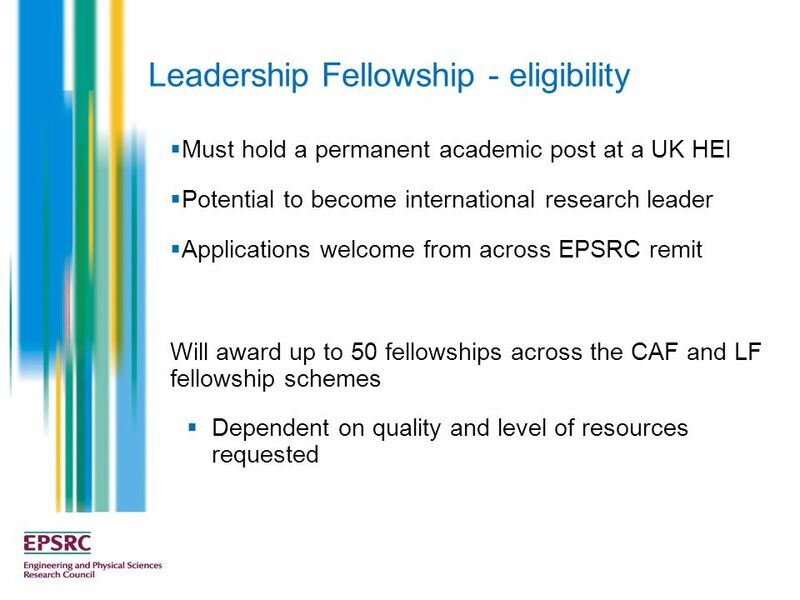 NUFFIELD DEPARTMENT OF PRIMARY CARE HEALTH SCIENCES Applying for an MRC fellowship Dr James Sheppard Nuffield Department of Primary Care Health Sciences. 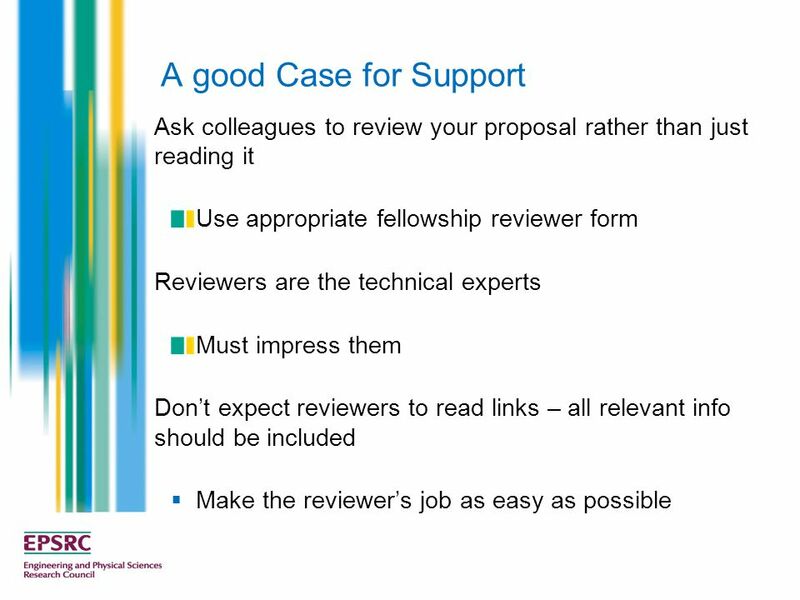 What are sponsors looking for in research fellows? 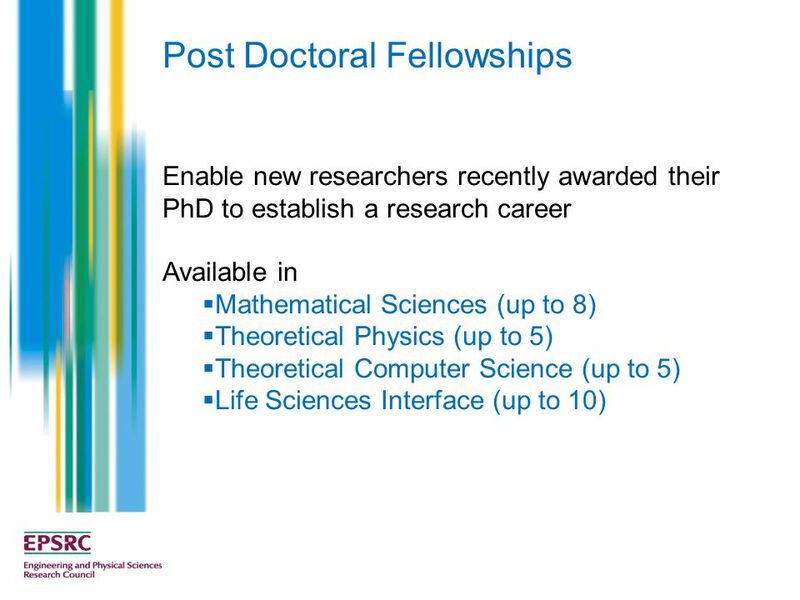 Melissa Bateson Professor of Ethology, Institute of Neuroscience Junior Fellowships.